(They have also added Telecom Italia, which, until 2011, owned 11% of ETECSA, but I will save that for another post). O3b's MEO satellites orbit at an altitude of around 8,012 km above the equator while Intelsat's geosynchronous satellites are at around 35,786 km. Therefore the time for a data packet to travel from earth to an O3b satellite and back to Earth is significantly less than to an Intelsat satellite. This move to O3b may be related to ETECSA's recent decision to offer SMS messaging service to the US (at an exorbitant price), and it will surely improve the speed of interactive applications. That is today's situation as I understand it, but now I want to speculate on the future of Cuban satellite connectivity — say in the early 2020s. First a little background on O3b Networks. O3b is a wholly owned subsidiary of SES but it was founded in 2007 by Greg Wyler, who has since moved on to a new venture called OneWeb. While O3b provides service to companies like ETECSA, OneWeb plans to also provide fast global connectivity to individuals in fixed locations like homes and schools as well as the "Internet of things." OneWeb plans to connect the "other 3 billion" people using a constellation of around 1,600 satellites in low-Earth orbit (LEO) at an altitude of 1,200 km and another 1,300 in MEO at 8,500 km. They are working with many vendors and partners and plan to launch their first satellites in March 2018. They will begin offering service in Alaska in 2019 and hope to cover all of Alaska by the end of 2020. By 2025 they expect to have 1 billion subscribers, and their mission is to eliminate the global digital divide by 2027. Now, back to Cuba. ETECSA is doing business with Wyler's previous company O3b. Might they also be talking with his current company, OneWeb? 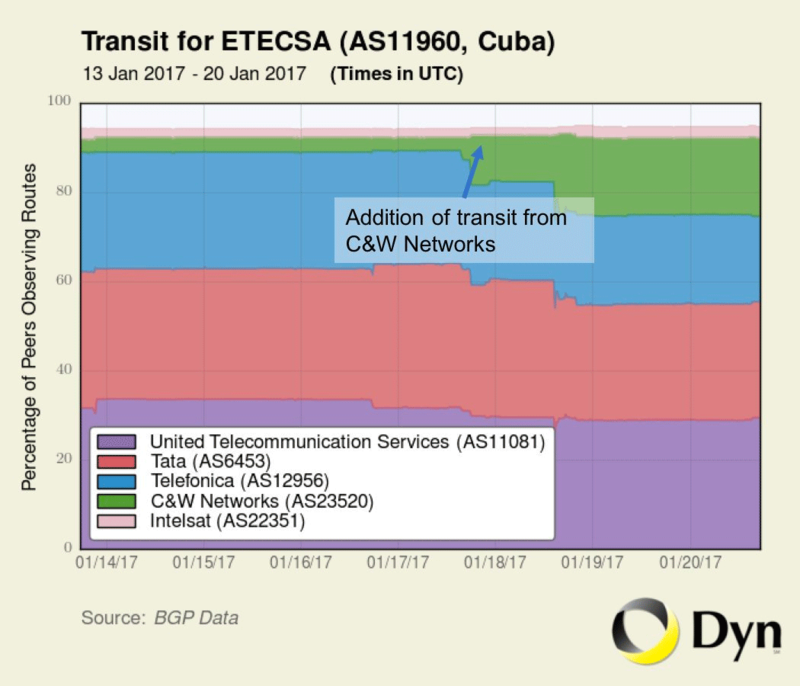 It takes time to launch hundreds of satellites, so service is being phased in — might Cuba come online sometime after Alaska? By connecting Cuba, OneWeb would gain publicity, the goodwill of many nations and access to a relatively well-educated, Internet-starved market and it would enable Cuba to quickly deploy broadband technology. As I said, this is pure speculation. OneWeb faces significant technical, business and political challenges and may fail. Politics would be particularly challenging in the case of Cuba. Both the US and Cuba would have to make policy changes, but maybe the time is right for that — the Cuban government will change in 2018, and the US government is likely to change in 2020 when Alaska comes online. OneWeb has established an indirect relationship with ETECSA through O3b, but other companies, including SpaceX and Boeing, are working on similar LEO projects. Might ETECSA be talking to the others? SpaceX is particularly interesting. Theirs is the most ambitious plan, and their experience as a rocket company is invaluable. Less tangibly, founder, CEO and lead designer Elon Musk is known for audacious risk-taking. OneWeb will begin with Alaska — might SpaceX begin with Cuba? In serving Cuba, they could also serve the Eastern US and since Cuba is an island the footprint of a satellite would not be so densely populated. SpaceX would gain publicity and international political good will. To learn more, see this survey of LEO satellite plans and related issues. 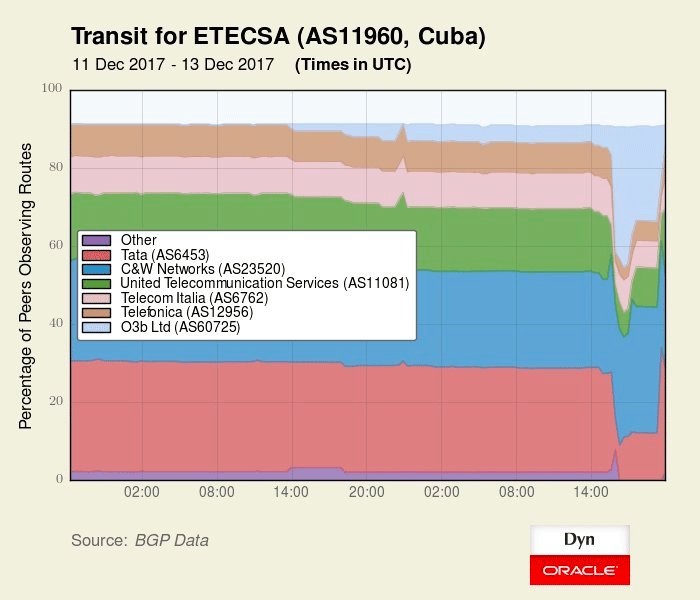 SES subsidiary O3b has gone public with their agreement to route ETECSA traffic and Doug Madory has updated the route graph (above) that he provided when he first noticed the link last December. 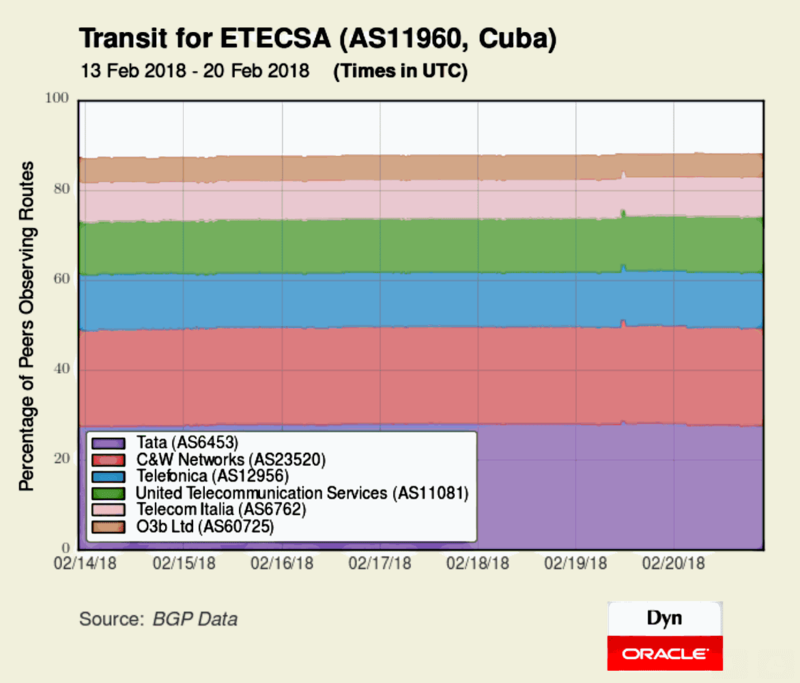 The following graph shows that O3b now accounts for about 5% of ETECSA's routes and, as in December, geosynchronous satellite provider Intelsat is gone. Latency over the O3b link will be much lower than it had been with Intelsat, so some users will see improved performance. 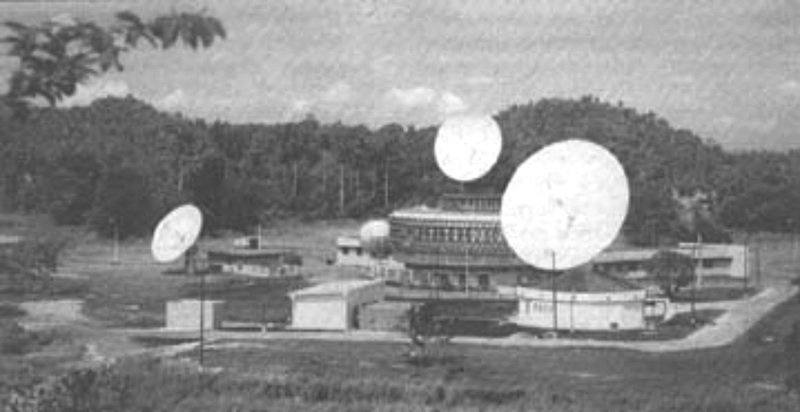 A friend tells me that the O3b ground station is about 25 miles east of Havana in Jarusco — the location of the original Soviet Carib 1 ground station in 1974. Local Time: Wednesday, April 24, 2019 09:09 PM PDT – Page Load: 0.2882 Sec.